Miskin Law Blog: Donald Trump Has Already Lost the Election. Maybe He Did Not Want to Win. Donald Trump Has Already Lost the Election. Maybe He Did Not Want to Win. Donald J. Trump could have become the next President of the United States, but this will not happen. At the Republican Convention he chose a traditional conservative Republican, Indiana Governor Mike Pence as his running mate, which was a sensible popular move. Since then, despite Pence's efforts to help, Trump has failed to "pivot" or shift to what must be done to broaden his base and win a general election. It is like Trump intentionally has chosen to lose by continuing a polarizing campaign with a very narrow and shrinking base of support. Since the Democratic Party convention, which nominated Hillary Clinton for President and Tim Kaine for Vice President, Mr. Trump's behaviour has alienated most of the people who wanted to give him a chance. He has fallen far behind in swing states and solid "red states" are turning blue. Hillary Clinton would not have been a difficult candidate to beat, if Mr. Trump did what was needed to appeal to more voters instead of doubling down on his extreme polarizing statements which only appeal to uneducated angry white men and very few women. There are not enough angry white men in the USA anymore to elect a President. Mr. Trump has lost the support of educated white people, who historically are in the majority conservative and do support Republican candidates. This is particularly true of women who make the difference in the urban areas of swing states. With his reckless words, Mr. Trump has shown that he is not mentally stable enough to be a world leader and he has frightened the very people who he needed to have with him. The national security establishment and big business leaders who normally support Republicans, are now supporting Hillary Clinton for President. Other Republicans are turning to the Libertarian candidates or elsewhere. Despite Secretary Clinton's unfavorability ratings being higher than any candidate before her, Donald Trump, who had a reputation as a successful businessman, through his own words and conduct has made himself even more unfavorable. Trump has completely driven away support of ethnic minorities including blacks and hispanics who now form large anti-Trump voting blocks. Election coverage is trying to make it look like it may still be a close race but it is essentially over. It is too late for Trump to redeem himself. The Clinton Plan is a simple one: keep everyone talking about Trump and there will be a Clinton landslide win. 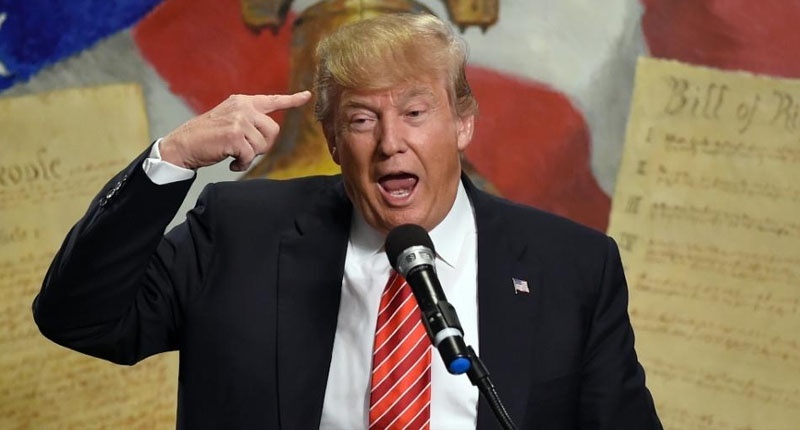 Donald Trump may be a victim of his own personality disorder (narcissism) or sleep deprivation, causing unstable conduct or he may have decided that he just does not want to take on the onerous and perhaps what he considers boring duties of the President. By running as the Republican candidate he will certainly have built the Trump brand, where all publicity is considered good, but he will not become President. He has boosted his ego more by running for President than by anything else he could have done, and it may in the end translate into making more money in future business ventures. The Trump campaign is leaving the Republican brand in shambles and that party will need to rebuild. Those who compromised themselves by sticking with Trump like Paul Ryan will never have the credibility and respect that they used to have. It is almost certain that the Republicans will lose control of the Senate and there is a chance they may also lose control of the House of Representatives which would actually end the gridlock in Washington. Donald Trump has inspired fear among Americans and around the world. The world will be relieved when it is all over and will look forward with hope to the stability of a Clinton return to the White House.